1. Offer; Acceptance. These terms and conditions (these "Terms") are deemed part of all quotations, acknowledgments, invoices, purchase orders and other documents relating to the sale of goods and services (the "Goods") by NTN Bearing Corporation of Canada (hereinafter called “Seller”). If these Terms differ in any way from any purchase order, release or other document from Buyer, these Terms shall be construed as a counteroffer and will not be effective as an acceptance of any other term except on the express condition that Buyer assents to these Terms; provided that Buyer is deemed to have accepted these Terms upon the earlier of 10 days after receipt without objection and acceptance by Buyer of any Goods. 2. Warranties. (a) Exclusive Warranty. The exclusive Seller warranty is that the Goods are free from defects in materials and workmanship. This warranty is extended solely to Buyer and not to any successive buyers, users or other third parties. The duration of the warranty is one (1) year from the date of delivery. Buyer must notify Seller of any defect in materials and workmanship in writing, no later than 13 months from the date of delivery. SELLER MAKES NO WARRANTY OR REPRESENTATION, EXPRESS OR IMPLIED, ABOUT THE MERCHANTABILITY OR FITNESS FOR A PARTICULAR PURPOSE OF THE GOODS. BUYER ACKNOWLEDGES THAT IT ALONE HAS DETERMINED THAT THE GOODS WILL SUITABLY MEET THE REQUIREMENTS OF THEIR INTENDED USE. SELLER DISCLAIMS ALL OTHER EXPRESS WARRANTIES. (b) Buyer Remedy. The exclusive remedy of Buyer as to any defective Good is that Seller shall repair or replace (at Seller's option) the Good (with Buyer responsible for labor charges for removal or replacement thereof), such obligation being subject to the following: (i) the Good's application was approved by Seller; (ii) Buyer delivers the Good to Seller with transportation charges prepaid; and (iii) analysis by Seller verifies that the Good was properly handled, installed, maintained, lubricated and not subject to abuse, misuse or inappropriate modification. 3. Liability. 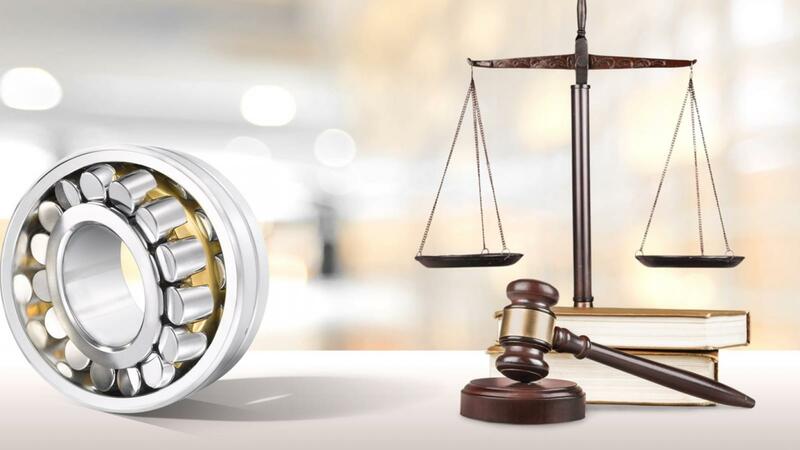 SELLER SHALL NOT BE LIABLE FOR SPECIAL, INDIRECT OR CONSEQUENTIAL DAMAGES, LOSS OF PROFITS OR COMMERCIAL LOSS IN ANY WAY CONNECTED WITH THE GOODS, WHETHER SUCH CLAIM IS BASED IN CONTRACT, WARRANTY, NEGLIGENCE OR STRICT LIABILITY. Further, in no event shall liability of Seller for any act exceed the price of the Good on which liability is asserted. Buyer must commence any action within one year after the sale of such Good by Seller. 4. Delivery; Packaging. (a) Dates. Delivery and shipment dates are estimated dates only. (b) Partial Shipment; Etc. Each partial shipment is deemed a separate contract for the delivered Goods. (c) Shipment Terms. All shipments are freight collect - FOB shipping point and Seller reserves the right to select transportation methods and routing. (d) Packaging. Seller will package Goods as it deems proper for protection against normal handling and extra charges apply to special conditions. (e) Risk of Loss. Risk of loss will pass to Buyer upon tender by Seller at the point of shipment defined as Seller's dock. 5. Pricing; Payment; Etc. (a) Pricing. Prices are subject to change without notice, and prices in effect on the shipping date will govern. Any increases in freight rates or transportation charges before shipment will be for Buyer's account. Prices also are subject to increase for any taxes, duties (including dumping duties) or other charges imposed on Seller by any governmental authority for the sale, delivery or use of the Goods. (b) Payment. Terms of payment are net 30 days from the invoice date. If Buyer fails to make any payment when due or Seller otherwise deems itself insecure, Seller reserves the right to change terms of payment and discontinue shipments. Buyer agrees to pay Seller's customary late and interest charges for any failed or late payments. 6. Inspection; Etc. Buyer promptly shall inspect all delivered Goods. If Buyer does not inspect any Goods within six days of delivery, Buyer is deemed to have waived its right to inspect and to accept the Goods. Buyer must report to Seller shortages or defective Goods within six days of receipt. Buyer may not return Goods without Seller's written consent, and Buyer’s acceptance shall be final and irrevocable. 7. Cancellation; Etc. Orders approved and accepted by Seller shall constitute firm commitments of Buyer and are not subject to cancellation or rescheduling. Orders for non-standard Goods may not be canceled at all and such Goods may not be returned for credit. 8. Indemnities. Buyer shall indemnify and hold harmless Seller, its employees and representatives from and against all liabilities, claims, actions, costs, expenses and disbursements (including attorney's fees and disbursements) related to any investigation, litigation or other proceeding (whether or not Seller is a party thereto) which arises or is alleged to arise from Buyer's acts or omissions under these Terms. Without limiting the foregoing, Buyer shall indemnify and hold harmless Seller and defend or settle any action brought against Seller to the extent that it is based on a claim that any Good made to Buyer specifications infringed intellectual property rights of another party. 9. Confidentiality; Inventions. (a) Confidentiality. All information and materials supplied by Seller to Buyer relating to the Goods are confidential and proprietary, and Buyer shall limit distribution thereof to its trusted employees and use its best efforts to preserve the confidentiality thereof. (b) Inventions; Etc. If Seller or any of its affiliates makes a discovery or invention pertaining to any research, development or design work contemplated hereby, such discovery or invention shall be the sole property of Seller and licensing shall be at the discretion of Seller. 10. Force Majeure. Seller shall not be liable for any delay or failure in delivery resulting from causes beyond its control, including earthquakes, fires, floods, strikes or other labor disputes, shortage of labor or materials, accidents to machinery, acts of sabotage, riots, delay in or lack of transportation or the requirements of any government authority. 11. Miscellaneous. (a) Waiver. No failure or delay by Seller in exercising any right and no course of dealing between Buyer and Seller shall operate as a waiver of rights by Seller. (b) Assignment. Buyer may not assign its rights hereunder without the Seller's written consent. (c) Law. This Agreement and any contract of which these terms and conditions are a part, shall be interpreted, construed and enforced under the laws of the Province of Ontario. (d) Amendment. This Agreement constitutes the entire agreement between Buyer and Seller relating to the Goods, and no provision may be changed or waived unless in a writing signed by the parties. (e) Severability. If any provision hereof is rendered ineffective or invalid, such provision shall not invalidate any other provision. (f) Setoff. All claims hereunder by Seller are subject to setoff by Seller for any counterclaim arising out of any transaction with Buyer. (g) Tooling; Etc. All materials, equipment, facilities and special tooling Seller uses to manufacture Goods shall remain the property of Seller. (h) Definitions. "Including" means "including without limitation." 1. Quotations are This quotation is valid for a period of 30 days from the Quote Date. Pricing is subject to change beyond this period. All taxes are extra. 2. All billing discrepancies must be reported to NTN with 10 days of receipt of goods. New accounts are required to supply trade references and we reserve the right to ship COD until satisfactory references are in our hands. Minimum billing is $100.00 Net. 3. Deliveries that are quoted as stock are subject to prior sale. We are not responsible for any loss or damage caused by delays in delivery. 4. Non-standard items which are ordered specially may not be cancelled. Any order accepted by NTN may only be cancelled in writing by an authorized employee of NTN. Any damages to be paid to NTN as a condition of cancellation will be agreed upon in writing by the parties at that time. 5. NTN will, at its option, replace or give credit for any item which, if properly selected and used, shows from laboratory examination defective workmanship or material. This guarantee applies for one year from the date of delivery of the item. No goods can be accepted for return without prior inspection and written approval from an authorized employee of NTN in the form of a RGA or Returned Goods Authorization Form. Return charges must be prepaid and claims for labour or incidental damage will not be allowed. 6. Unless otherwise stated, shipments will be shipped collect FOB our warehouse, and unless shipping instructions accompany your order, these shipments will be routed at our discretion. All goods are carefully inspected prior to shipment. In the case of damaged goods please notify the carrier immediately. All discrepancies must be reported to NTN within 10 days of receipt of goods. 7. NTN has no responsibility for loss or damage caused by inability to deliver or delay in delivery, whether this is the result of NTN or its servants or agents or arises from circumstances beyond our control, such as acts of God, fire, accidents, strikes, lockouts, or otherwise. 8. A minimum charge of $100 will apply, if After Hours Service is required from any of our warehouses.